Why is it that choosing a Valentine’s Day gift for the one you love can sometimes be difficult, even when you know them so well? Sure, you could get them that book or sweater they mentioned. But this year, you feel like doing a bit more. You want to give them something creative and memorable — something that leaves them feeling completely loved. There’s nothing like the gift of quality time and adventure. This year, you can keep things fresh and exciting by booking a romantic getaway. 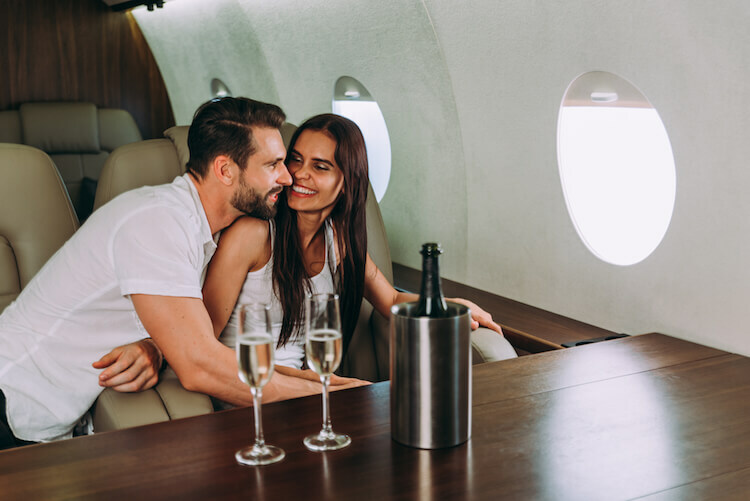 Between the private jet rides, adventures to new places and luxurious places to stay, 2019 could very well end up being your best Valentine’s Day yet. Enjoy this cheat sheet with 5 of the most romantic getaways to book for this Valentine’s Day. Does the idea of cuddling up by the fireplace after a long day of skiing make you want to grab your partner and your snow boots and head out the door? If so, Beaver Creek may be the Valentine’s Day destination for you. Enjoy a new adventure every day with skiing, snowmobiling and more. Experience an enchanting stay at the Ritz-Carlton Bachelor Gulch, a ski-in luxury hotel tucked into a scenic mountainside. Warm up while watching memorable performances at the Vilar Performing Arts Center. Kauai was named US News’ number one best romantic getaway, and it doesn’t take long after arriving to find out why. The perks of Kauai go far beyond its beautiful beaches. It’s packed with romantic activities from fine dining experiences to browsing unique art galleries. Take your pick of one or all of Kauai’s famous spas. Enjoy the sunset from the ocean with a one-of-a-kind sailing tour. Get a memorable bird’s-eye view of the island on a helicopter ride. One Valentine’s Day spent in alluring Dubai can contain enough romance to last a lifetime. It’s located on the Eastern Coast of the Arabian Peninsula. The beautiful city contains world-famous structures like the Burj Khalifa, Burj Al Arab, and Miracle Garden. It’s rich with culture and experiences. Too many, in fact, to enjoy in just one trip. Book a stay at the one-of-a-kind Armani Hotel and ask for the “Romantic Stay Package.” The package includes a daily breakfast buffet, a special welcome amenity, and a 3-course dinner for 2. Let someone else take care of the details with a 6 day honeymoon tour that includes top-notch dinners, tours, and more. Whether you’re ready to pop the question or are simply looking for fine jewelry to commemorate your visit to Dubai, stop by Gold and Diamond Park, packed wall to wall with some of the world’s best jewelers. Bassano del Grappa gives you all the unique pleasures of Venice without the Valentine’s Day crowds. It’s located in stunning northern Italy where the Venetian Plain meets the Alps. This fairy tale city is most known for its beautiful covered bridge over the Brenta, their grappa liquor, and timeless ceramics. Visit the world-famous Town Museum for an exclusive look at works by artists such as Canova and Rembrandt. Engage in the lively culture of Italy with a visit to Piazzas Liberta and Garibaldi for spontaneous outbreaks of music and fun-filled shops. Take advantage of countless photo opportunities with Bassano del Grappa’s magical architecture and landscape. Rolling hills, delectable wines, and relaxing beaches are only the beginning in Napa Valley. Be sure to pack your formalwear and your adventure wear, because Napa Valley will have you using both. Feel on top of the world in a hot air balloon where you’ll share some of America’s most romantic views. More than your average tasting, the Napa Valley Wine Train gives you and your partner your choice of a variety of memorable meal experiences. Choose from a starlit evening being serenaded, afternoon winery hopping, and more. After a romantic exploration of the valley, kick back and enjoy the sheer luxury of the Très Romantique package at Auburge Du Soleil. This dreamy package includes an outdoor candlelit bath for two, a couple’s massage, a private soak and herbal steam, and breakfast for two in the morning. Romance is different for everyone. That’s why we’ve provided an option for any preference from cozy mountain cabin to starlit beaches.